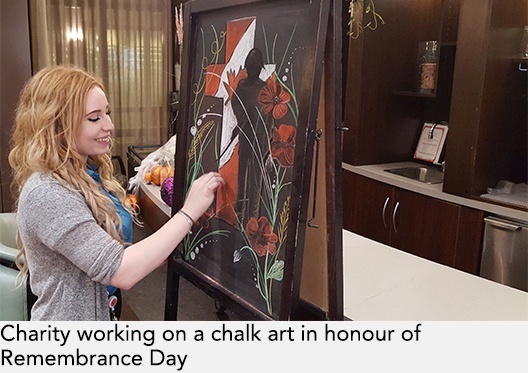 When Charity Votary began working as a dining room server at Royale Place Retirement Residence in Kingston, she didn’t expect that her love of art would make its way into her everyday work. 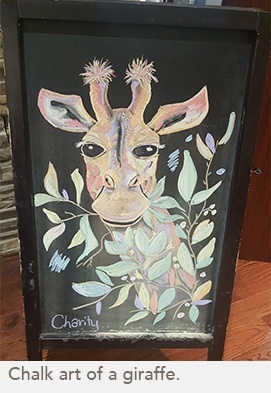 But when she saw a chalkboard menu in the dining room, she couldn’t resist the urge to add drawings around the menu items. “Eventually, I just took over and started taking up the whole board with drawings, and the residents really enjoyed it,” she said. 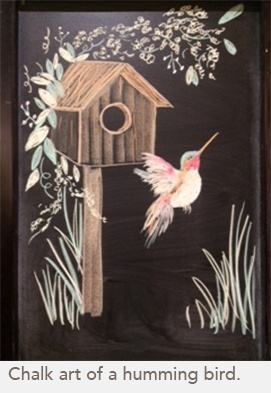 Her drawings are often seasonally-inspired, with sunshine, flowers and birds for summer, and pumpkins, leaves and holiday images for fall. Charity’s love of art and music began at a young age. After experiencing mobility and health challenges for all of her life, she discovered art and music as a way to cope. Residents have also asked her to paint special pieces for them. A resident asked her to paint two roses intertwined, to symbolize his upcoming wedding. “He loved it so much that he placed it on his walker and took it on a tour around Royale, sharing it with his friends and the team members,” Charity said. She also recently painted a portrait in honour of a resident’s late wife. Charity is currently working part-time and completing a recreation and leisure studies program. She has truly found her calling in working with seniors.